ENTER TOTAL SQUARE FEET IN QUANTITY BOX WHEN ORDERING. PRICE IS PER SQUARE FOOT. Please note: Minimum ArmorUltra Job on a Pallet is 500 Square Feet. ArmorUltra is a Super-Duty Military Grade floor coating system. Used by car dealers, aircraft maintenance facilities, airplane hangars, restaurants, kennels, stores, and in other super high-use installations. Manufactured from the finest, most expensive ingredients available. Not available in home centers or paint stores. Unique 3 layer system of primer/epoxy/topcoat is at least 5-6 times thicker than standard floor paint (25-30 mils thick). Super heavy duty for the most demanding applications. Mid layer 100% solids epoxy is applied with supplied calibrated squeegee. 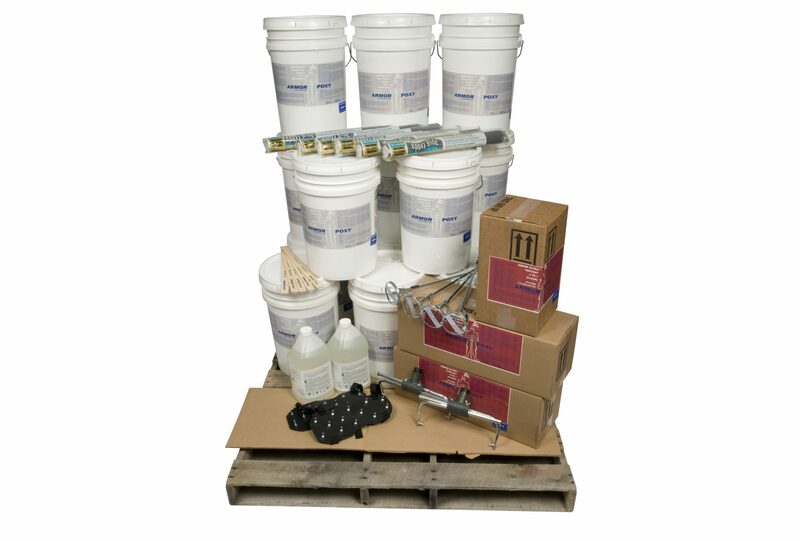 Kits include the following: ArmorEtch concentrated etch solution, ArmorUltra self-priming 2-part industrial epoxy primer, 100% solids high build ArmorUltra epoxy, ArmorUltra Military-grade protective topcoat (pigmented for better coverage – not clear), UltraWear high wear non skid powdered metal wear additive, power mixers (for your drill), mixing bucket with liner, 18″ industrial roller frames, 18″ epoxy roller covers, calibrated notched squeegee for application of the high build epoxy, spiked shoe bottoms (for walking on wet epoxy), complete instructions and full, unlimited free telephone support. Certain colors such as white, off white, red, and other highly pigmented bright colors will charge out at additional 29 cents/ sq ft due to higher pigment costs. Smaller orders may go Fedex Ground and not on a pallet for faster service. Lead time 1-2 days plus transit time. Additional colors, including all OSHA-Approved safety colors are available for base coats or line/hazard marking. Please contact us for any special requests, ‘decorative chip’ projects, high acid/chemical resistant projects, and any other type of special or unusual floor, or for floor repair special products to repair cracks and floor damage. For ‘fleck’ type floors please call us to order due to the many color combinations available 888-755-7361 9-5 EST M-F.
Job on Pallet Orders must be paid by standard credit cards only, not Paypal since the shipping charges must be manually calculated and we are unable to charge the shipping to these forms of payments. Please select standard credit card payment when checking out.